I can’t believe I just renewed my domain for another 2 years. It's been such an amazing year! I love interacting with fellow bloggers and of course, with my readers as well. To give back, there will be a giveaway every week for the next 4 weeks here at PetiteLittleGirl.com. I am very thankful that Ann Taylor has generously offered a couple of goodies to giveaway for my readers. I love how they work on staying connected with bloggers in a number of different ways. 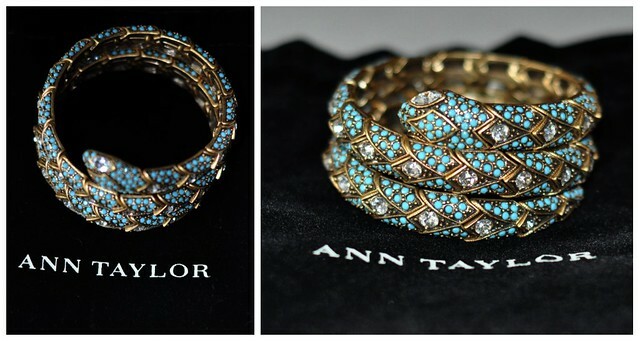 For this week’s giveaway, one lucky reader will win this gorgeous Ann Taylor Coil Snake Bracelet. It is truly a statement piece of jewelry. To be fair with everyone, I will verify all entries. Winner will be chosen on Tuesday 07.11 along with a new giveaway announcement. Disclaimer: Ann Taylor has generously provided this bracelet for the giveaway. I am not associated with them in any way. I will not be compensated for posting this giveaway on my blog. Enter me, pretty please! That is gorgeous! Enter me, please =) Ann Taylor woot! Love this bracelet. Enter me please. BTW, Are you in Dayton? I went to school there. It was such a nice and neat town. I decided not to enter jean's bc I have won before and wanted to give others a chance. but I did read that she said this bracelet is small, so I tried to buy it over the wkd, but sold out near me. So now I'm going to enter this giveaway instead! Thx for the opportunity Sydney. Enter me please :) Such a cool bracelet! I would love to win this. Please enter me. Thanks. Just discovered your blog recently and i LOVE IT! Enter me please! I remember that this bracelet is small, which is 'perfect' for me. The bracelet is gorgeous. I'd love to enter. Enter me, please. Thanks Sydney. Enter meeee! Thanks for the giveaway! LOVE this bracelet! Enter me please! It's such a beautiful braclet. Enter me please! This bracelet is beautiful. Please enter me. =) Thank you for hosting! It's gawjus. Hi Sydney ;) Please enter me too!! I love this bracelet. Ooh pretty. Please enter me. OOOO, enter me please! Thank you! I have been reading your blog for a while now, guess this is the perfect time to make it public...love that bracelet! Please enter me. Please enter me...love the bracelet!!! Enter me. The bracelet is beautiful. Thanks for having this giveaway. Please enter me. Thank you!!! yay. Yay - please enter me :) Thanks so much, Sydney for hosting!! Enter me! And thank you! Enter me into your giveaway! Thank you for hosting and congrats on 2nd yr.
would love this, please enter me! thanks! please enter me! love the bracelet! Sign me up for the bracelet please! Enter me please! That bracelet is LOVE! enter me please! love the gorgeous snake bracelet!